Was it a meaningful stock price move or just noise? 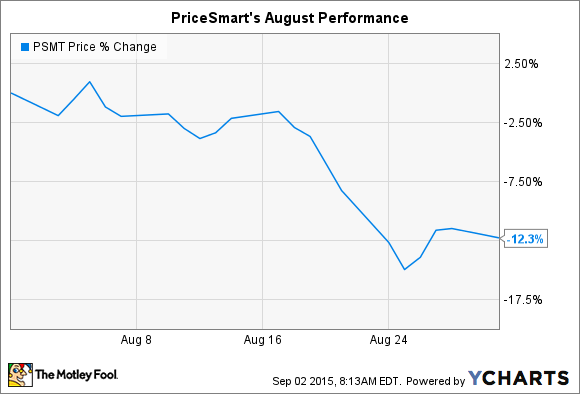 What: PriceSmart (NASDAQ:PSMT) stock fell by 12% during the month of August, according to S&P Capital IQ data. The dip put shares of the warehouse club at a 10% loss through the first eight months of 2015 and an 8% drop over the last full year. However, those results are roughly even with the broader market's losses over the two time periods. So what: PriceSmart, which operates 37 retailing warehouses across Latin America and the Caribbean, on Aug. 7 posted a minor slowdown in revenue growth for the month of July. Sales at existing locations improved by 3.5%, compared to 4% in the prior month. That makes it likely the retailer will announce slower growth for the full third quarter when it reports earnings results next month (last quarter's gains were 4.6%). Yet the bigger reason for the stock's drop was likely the sell-off in the market as a whole. PriceSmart's losses were concentrated in the final two weeks of August, a time over which the S&P 500 fell by a brutal 9%. As a relatively small company -- with less than $3 billion in market capitalization -- this retailer's stock is likely to see volatility, especially during the type of turmoil we've seen in the past month. Now what: Shareholders can ignore those short-term swings and instead keep their focus on PriceSmart's business and expansion plans. To that end, the company expects to open its second club in Nicaragua by November, while laying the groundwork for another location in Bogata, Colombia's capital city. Its single Bogota warehouse currently has the most members of any of its 37 locations, which is strong evidence that the area can support at least one more store. In the meantime, management is using its surging Colombian business as a means of boosting efficiency in the entire region. "We have seen improvements in the way we are buying and sourcing a lot of our electronics, major appliances and computers," said CEO Jose Luis Laparte in last quarter's conference call. In addition to stronger comparable-store sales growth, investors should look for evidence of these gains showing up in higher membership fee income and rising average spending per shopper.